Hello lovelies! 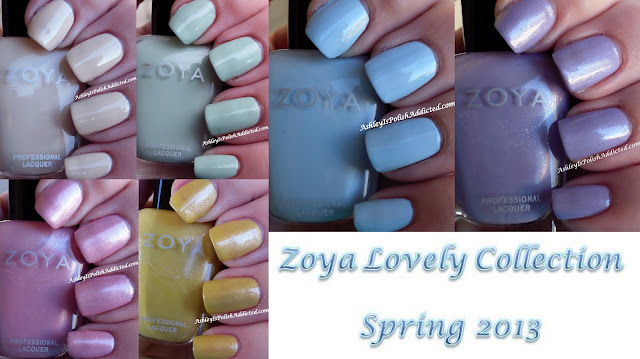 I have another collection review for you tonight - this time for Zoya's Lovely Collection for Spring 2013. I am going to show you the cremes first. The three cremes - Neely, Jacqueline and Blu - all had very similar formulas. They were all on the thin side and needed careful application to avoid dragging. Make sure the base coat is dry before applying the second coat and don't over-manipulate and you should be fine. They were all opaque in two coats. All photos are 2 coats and no top coat. Neely is a shade of green that reminds me of a pale pistachio. This one is quite lovely but didn't like me very much. I must add that with as many greens as I have (and that is quite a lot), I don't have any that are a dupe of this color. Jacqueline is a warm neutral that leans yellow in certain lighting situations. This one doesn't like me but neutrals vary so much from person-to-person and you really need to try them to know if they work for you. Blu is my favorite of the cremes in this collection and had a slightly better formula than the other two - it wasn't quite as thin. This one is a beautiful sky blue. Now we have the three shimmers in this collection - Piaf, Gie Gie and Julie. All three of these were exactly the same in formula and application. They were extremely thin and required very thin coats to avoid flooding my cuticles. These are described by Zoya as a metallics but I wouldn't call them metallic, I would call them shimmers. All needed three coats for opacity and are pictured with 3 coats and no top coat. Piaf is a golden yellow that is perfect for spring. This color is very lovely (no pun intended hehe) - it's not my personal favorite but if you are a yellow lover you will love this one. Gie Gie is a very pretty pastel pink that is packed with shimmer. I could still see slight VNL (visible nail line) with this one after 3 coats. What do you think of this collection? Which ones are your favorites? Zoya polishes are available at zoya.com and at select Ulta locations for $8.00 each. Be sure and "like" Zoya's Facebook page and follow them on Twitter for latest news and promos. They have a lot of sales and specials. Zoya appreciates their customers and knows how to keep them! And don't forget they are 5-FREE and Cruelty-Free! I love this collection so much! Julie is definitely my favourite, followed by Blu. I can't resist pastels! Pastels aren't my thing but I do love Julie. Some of them are ok, but I actually dissapointet on this whole collection.